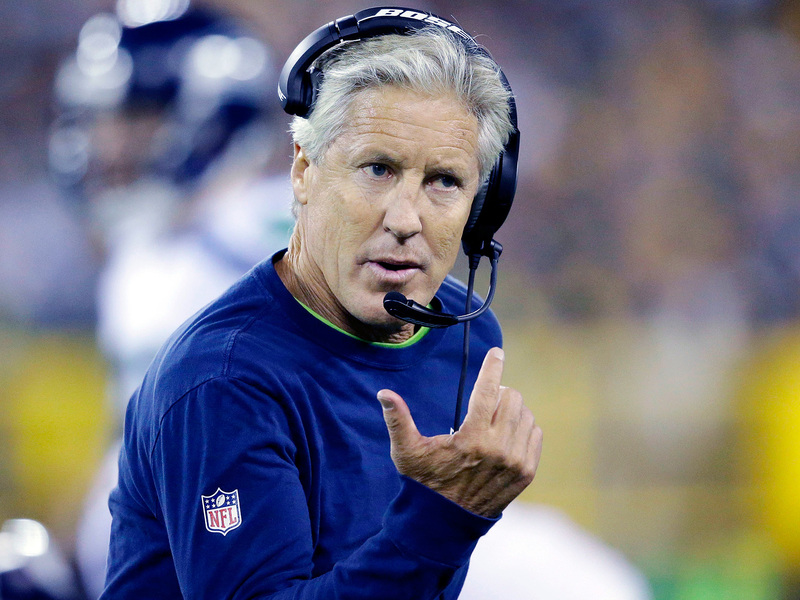 Pete Carroll's players are very familiar with his repetitive philosophy and expectations. So this off-season, in an attempt to reach them once again, the Seahawks coach surprised them all and changed up his approach. RENTON, Wash. – As the 2016 off-season unfolded, the Seahawks expected their coach, Pete Carroll, to emphasize the tenets of what he calls his program. Same as always. They expected to hear all the usual Carrollisms splashed across their facility—let’s work and don’t be the one and it’s all about ball—as another season full of Competition Wednesdays and Tell The Truth Mondays drew closer. But Carroll did not do that as much as in recent seasons. And while nothing their coach does surprises the Seahawks anymore—he did tackle a white board before a playoff game last season, after all—the different tact he took this spring stood out to the veterans, several told SI.com. Carroll will turn 65 in September, in his seventh season as Seattle’s coach, and with Tom Coughlin no longer in charge of the Giants, Carroll is now the oldest head coach in the NFL. There are obvious benefits to that kind of continuity: like Seattle’s record, at least 11 wins in each year since 2012. But there are drawbacks, too, to staying in the same place and saying the same thing to the same people over and over. Carroll realized the danger inherent there, and true to form—his being fluid, wacky and largely unconventional—he altered his approach. He looked at Seattle’s core, minus running back Marshawn Lynch who retired (we think) this off-season, and how long it had been together. From 2010: safeties Earl Thomas and Kam Chancellor. From 2011: cornerback Richard Sherman and receiver Doug Baldwin. From 2012: quarterback Russell Wilson, linebacker Bobby Wagner, receiver Jermaine Kearse. And from 2013: defensive tackle Michael Bennett, who returned that season, his first under Carroll. All have heard Carroll talk for at least three seasons and as many as six. They were familiar with his philosophy, his expectations, even his mannerisms, like the drastically crooked finger that stood out whenever he waved his right hand. They had won a Super Bowl together after the 2013 season and lost a Super Bowl together the next year. So to reach them once again, to hold their attention, to stave off boredom, Carroll decided to focus less on how he planned to operate, which the core was already familiar with, and more on why he came to this mad method in the first place. Will it matter in 2016? Who knows? Maybe not. But the Seahawks started 3–3 in 2014 and 4–5 last year. Perhaps there is something to the idea that it’s harder to motivate the same players the same way in years five and six compared to years one and two. When John Schneider, the Seahawks general manager, worked for Marty Schottenheimer in Kansas City, Schottenheimer told the staff that eventually all coaches and personnel types must move on, after five years or seven years or nine years, whenever players stopped hearing them the way they once did. Carroll hopes to test that theory. He says that every off-season is different. Two off-seasons ago he had to guard against the delightful hangover that accompanies a championship; last year, he had to overcome the impact of a devastating loss in the final minutes that cost his team a repeat. “I think that’s what he’s doing,” Baldwin says. That’s exactly what Carroll is doing, drawing on the experience of a core that has been together for years now, after a spring spent trying to better understand each other. It’s vintage Carroll, vintage Carroll-era Seahawks. Wilson, Carroll, the offensive coordinator Darrell Bevell—they all say the Seahawks have never been this far ahead in their off-season program, this in sync. Of course, they said similar things in previous seasons, and still stumbled once the games started. If that trend changes in 2016, they can point to Carroll’s approach through OTAs and mini-camps. They will know, you know, why.